I’m told that more and more musicians in the job market are turning toward military bands as symphony orchestras struggle in the current financial climate. 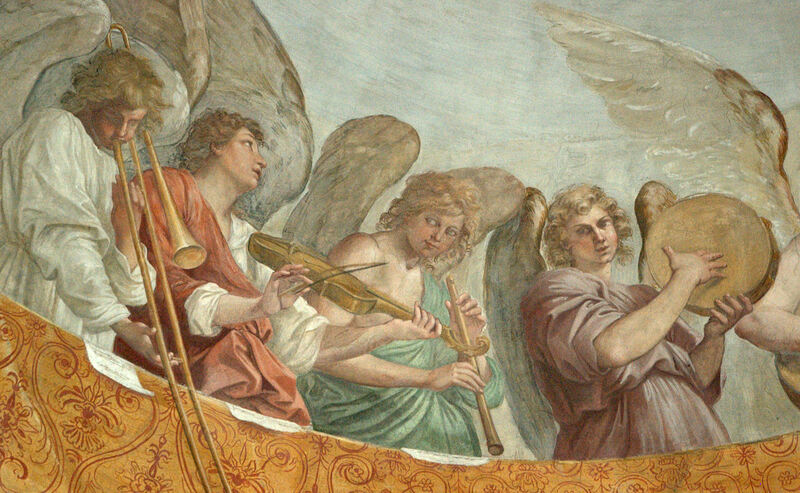 Interestingly enough, the history of the trombone in military bands actually goes back farther than it does in the traditional symphony orchestra. 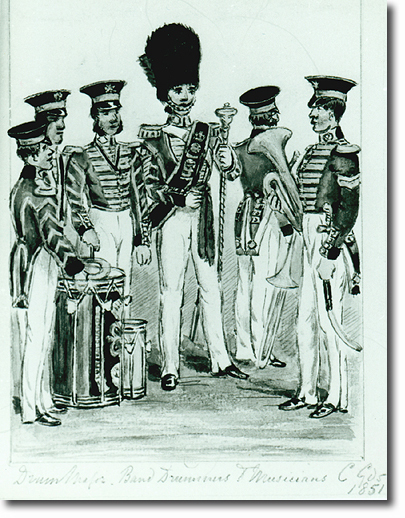 I also find it interesting that among the musicians in the earliest military bands were non-enlisted professionals who were hired for their services. Last April I made a post titled A Soldier I Will Be, highlighting several related additions I had made to the Trombone History Timeline. I have just finished adding several more military-related trombone images, so here they are, grouped together as Part 2 (you can find them in context in the Timeline in the 19th century (1st half), 19th century (2nd half), and 20th century). The common theme, besides trombone, is that they are all military bands of the British Empire. You may notice that a couple of the images also involve trombones on horseback, another theme I’ve highlighted before on this site. 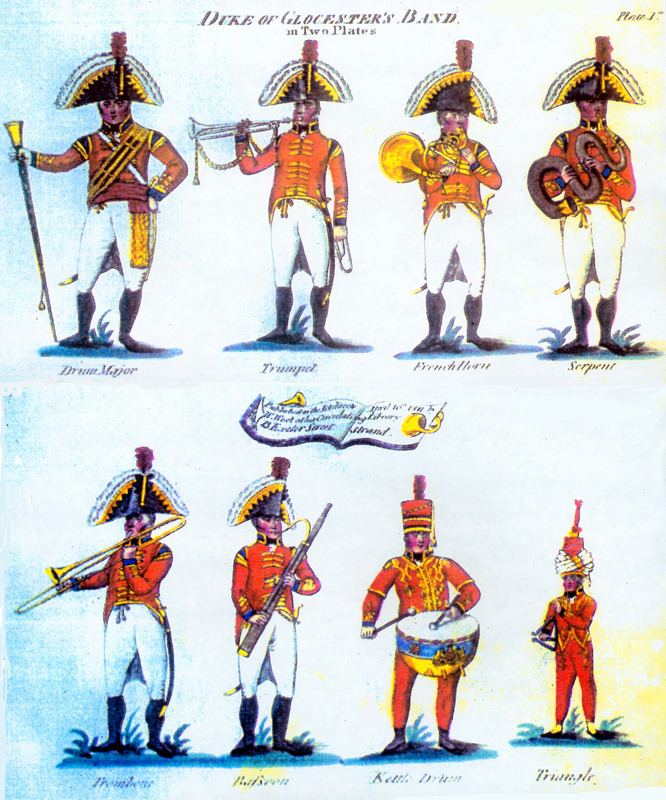 1811—An illustration of the Duke of Gloucester’s Band, an ensemble associated with the 3rd regiment of the Scots Guards, includes a trombone (see bottom left of below image; public domain). 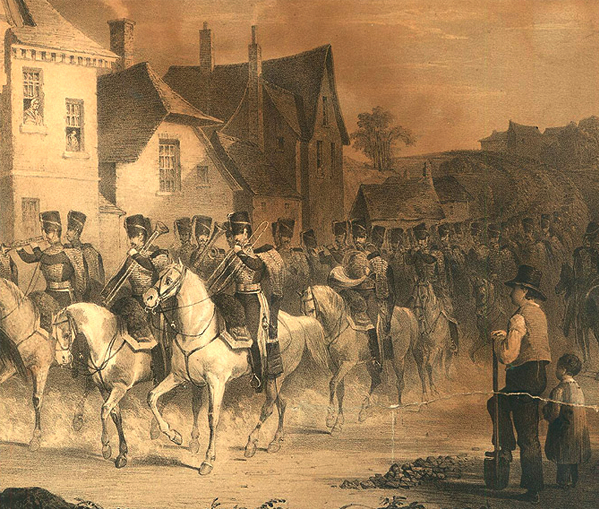 1851—An illustration of a British infantry band by Ebsworth includes a trombonist (the player in the back facing outward, evidently having lost interest in the proceedings) (see below image; public domain). 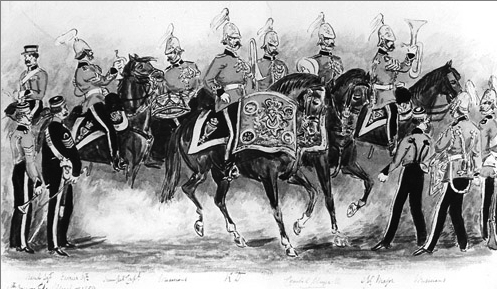 1859—A sketch by Aldershot of musicians of the 4th Royal Irish Dragoon Guards, a cavalry regiment in the British Army, shows a trombonist among a number of military musicians riding on horseback (see upper-middle of below image; public domain). 1898—A trombonist from The King’s Own Royal Regiment (Lancaster), an infantry regiment of the line of the British Army, is shown in military regalia (see below image; public domain). 1914—England: An illustration shows a trombonist from the British Royal Artillery in full military uniform (see below image; public domain).